I bought Marks Manual for the XR since the 2015 Manual is sometimes a bit hard to "read". Mark has done an excellent job and it is my "go to" document for service info now. He does ship to the US (I'm n Texas). The manual is still very much for sale, and I have stock ready to despatch - most orders go out on the day they're paid for. My website accepts payment by either Paypal or Credit card. The book covers removing all bodywork except for the coloured plastic panels either side of the headlight. You do not need to remove these for a regular service. 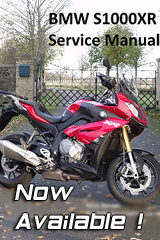 Whilst the bike has evolved slightly, the service work is unchanged so the book works for all S1000XRs sold (up to start of 2018 at least). Finally I have a brand new air filter manufactured by Hi-Flo-Filtro, which I bought before I sold my XR. I don't need it so its free to the first UK customer who asks for it when buying a manual from my website. There's a tel number there as well. Thanks - I didn't pick up on that there was a phone number there. Go on, get one and treat yourself to an early Christmas present !